In a forest, there lived many animals. One day, an argument broke out among the animals. They sat under the shade of the trees and argued about which animal was the greatest. ‘I am very beautiful. I am the greatest,’ said the Red-nosed parrot. ‘I dance very well. I am the greatest,’ said the peacock striking a dance pose. ‘I jump from branch to branch easily. I’ am the greatest,’ said the little squirrel. ‘I jump higher than you. I am the greatest,’ said the white monkey. ‘There is no other animal bigger than me in the forest. I’m the greatest,’ said the elephant. ‘I don’t need grass to survive. I’m the greatest,’ said the cheetah. The lion came quietly from the other side. ‘I’m the king of the jungle. Who dares to say that he is greatest whhen I’m around?’ roared the lion. 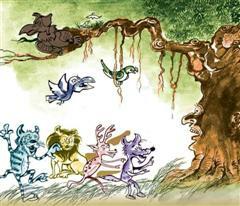 The tree was irritated with the arguments presented by all the animals. ‘Hey! Don’t make a noise here. I want peace. Go somwwhere else,’ the tree scoled the animals. All the animals and birds got angry with the tree. they told the tree rudely. It’s so true. Animals, birds and insects depend on trees. In fact, we too depend a lot on trees. Can we place a value on a tree? Actually we assess the value of a tree by the fruits and timber that it gives us. We are benefitted by trees in a number of ways. Around 25% of the medicines that we use come from plants. A group of trees help decrease the noise pollution. Trees spread over thirty square meters help decrease the noise from six to eight decibels. Trees form an important base for many industries. Paper-making industries are the best example of it. Trees are home to many birds and animals. Trees help in soil and water conservation A happy environment is created by green surroundings. 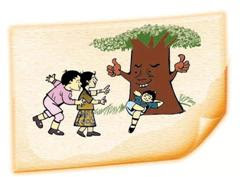 Can we put a price to the happiness that we get from greeney?If at all we assess the contribution of trees, then we get more than one lakh sixty thousand rupees of valuable service from a fifty year old tree! Trees are not dependent on us. The fact is that we are dependent on the trees. Trees have been on the earth longer than we have been. Still we cut down trees knowing well that we cannot survive without them.